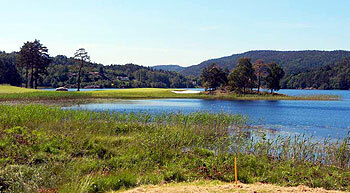 The course here at Bjaavann Golf Club opened in 2006 and it’s based around Lake Bjaavann, with the opening trio and closing pair of holes hugging the edge of the water. In between these holes, the fairways traverse dense forest, rocky outcrops and wandering streams as they take the golfer on a wonderful woodland journey. The signature hole at Bjaavann is the 170-yard 17th, the second of back-to-back par three holes on the back nine. Played from an elevated tee high above the level of the lake, golfers take aim at a green that juts out into the water with a large bunker placed front left to catch any timid tee shots. Robert Trent Jones II thinks very highly of the location chosen for this development: “The good people of the Bjaavann Golfklubb have truly provided a wonderful canvas to create golf art. This extraordinary site embodies all the many beautiful characteristics with which Norway is blessed. It is our job to merely discover and unveil a great golf experience while respecting Mother Nature”. I really enjoyed this course as it is a natural beauty. Fantastic elevation changes, great views, and a strong hole routing that challenges every aspect of your game. Despite last fall and the spring/summer weather challenges the course was still in good shape but I can imagine how strong it is during normal weather. The members were fantastic in taking in this guest and showing him the way around the course with great hospitality. I'd return here in a heartbeat to see this course in prime conditions and to play a round with wonderful people. Bjaavann is a beauty, plain and simple, and a very good golf course full of interesting challenges. The course might look short on the card but don’t be fooled, there are a few elevation changes that challenge both the teeshot and the approach. As usual with a RTJ II course there are clear choices with risk and reward, have a look at the short par four 3rd hole, played on the left fairway the teeshot is uphill, and approach downhill, but, played to the right fairway the hole plays considerably shorter and without any elevation, however your midiron to the right fairway needs to be exquisitely precise, even a slight miss would land you in severe trouble. Five holes play along lake Bjaavann and are particularly stunning as well as having the water as a strong component of the playing strategy. The rest of the course works itself thru beautiful forest and open parkland, and be warned, there are some marsh areas incorporated in the design so choose your line carefully, or, bring enough balls. The course closes unusually with two par threes before a majestic par five. Both the par threes are a study in indecision and the severely downhill 17th offers a gorgeous view of the lake. The home hole is long, and as you need to stay on the right side towards the lake for the ideal line it is also particularly nerve racking, simply a cracking par five!